Leaves of Kalanchoe daigremontiana (1-year-old) freshly harvested after the customer purchase and shipped on the same day. Fresh leaves of Kalanchoe Daigremontiana, harvested from the plant just before shipment. All the Kalanchoe Daigremontiana plants are grown in my land in Marche Region, Italy, in open countryside and in the open air. The cultivation is strictly organic, without the use of fertilizers, herbicides, or any kind of chemical pesticides. 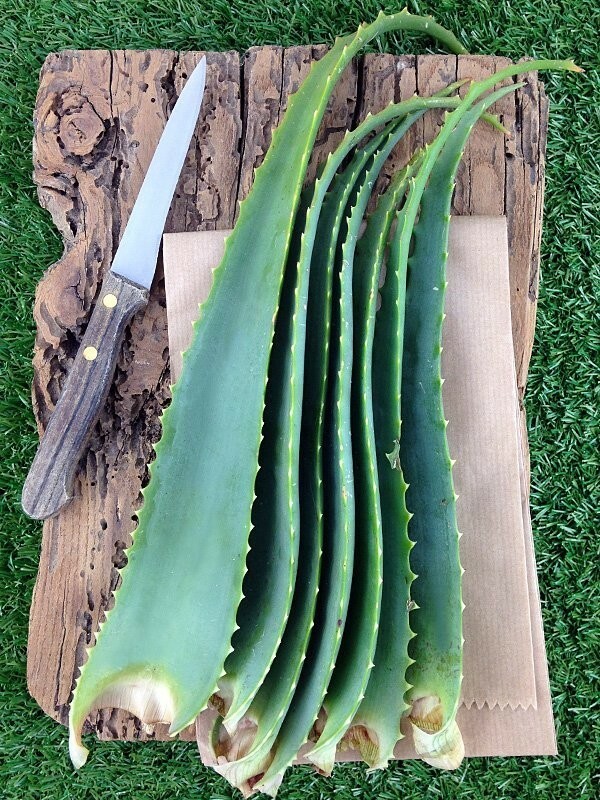 The best way to consume them is to eat them raw, as the cooking process destroys some of the nutrients. They have a slightly sour taste, but far from unpleasant. You can eat them raw on their own or in a mixed salad, mix or blend them with fruit, or with juices. As an alternative it is possible to use Kalanchoe leaves for the preparation of a tea infusion. In this case we take a teaspoon of leaves for a cup of water (250 ml). Leave the piece of leaf in boiling hot water for 10 minutes, then filter and drink. Dosage: do not exceed the dosage of about 30 g per day and in the case of herbal tea, do not exceed 3 cups a day. This is at least the recommended dosage also by Josep Pàmies, a Spanish farmer who first launched the medicinal use of this plant in Europe. Josep Pàmies also advises to consume every day the leaves of Kalanchoe, in the quantities indicated, and to take a break every month for at least 2 weeks. The leaves are fresh, so they should be kept in the fridge as normal vegetables and consumed within a few days. The Kalanchoe daigremontiana (also known as Bryophyllum) is a plant of the Crassulaceae family, native of the large island of Madagascar. The plant has juicy and fleshy oblong-lanceolate leaves. It has an upright trunk, and, with time, it starts to become woody from the bottom. During the winter, if kept warm, the plant blooms with beautiful tubular flowers, from gray-pink to pink-purple. 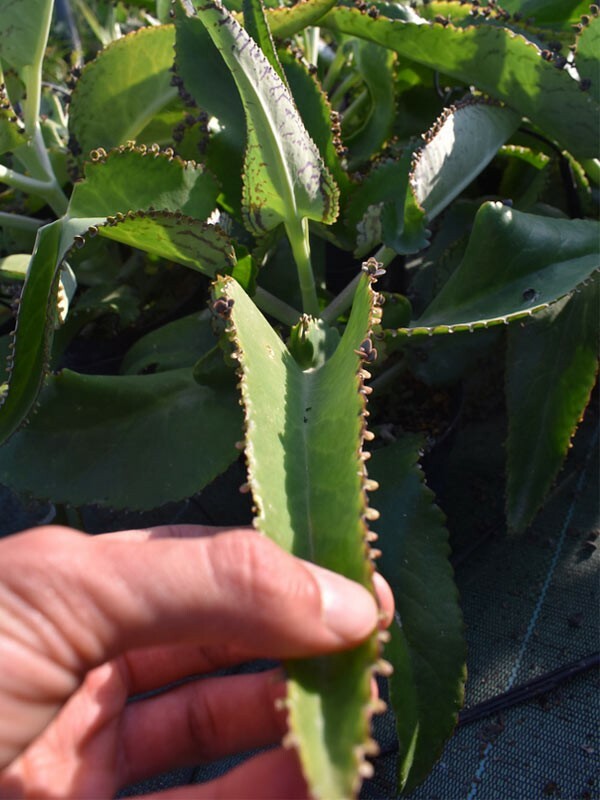 In Latin America, where the cultivation and medical use of this plant is more widespread, it is also called by many other names, such as Arantes, Mother of Thousands, Spine's Backbone and Mexican Kalanchoe. In Italy the Kalanchoe daigremontiana is considered only an ornamental plant, but in some tropical countries and recently also in Spain, thanks to the work of the botanist Josep Pàmies, this plant is primarily used as a medical remedy for the treatment of numerous diseases, such as burns, infections, ulcers, diarrhea, hypertension, diabetes and even cancer. Do not take the leaves during pregnancy as they can stimulate the uterus. It is not advisable to take the plant continuously over long periods of time. It is suggested to take the leaves every day, for a month in a row, and then take a break of 15 days. The plant's composition includes components like bufadienolides which are cardiac glycosides, therefore patients who have suffered from heart disease should consult with their doctor.